What Is a Block Style Letter? Business letters are generally formatted using a block style, of which there are at least three: standard block style, modified block style and semi-block style. Newer letter styles, such as the simplified style, are based on the block style. Each style prescribes margin widths, paragraph spacing and the order of the letter's content. The standard block style is a popular choice because it is the easiest layout to format. The standard block letter style and its variations are meant to be used as guides to help you format letters. Examples of each style and free templates are available online, each a bit different than the next. 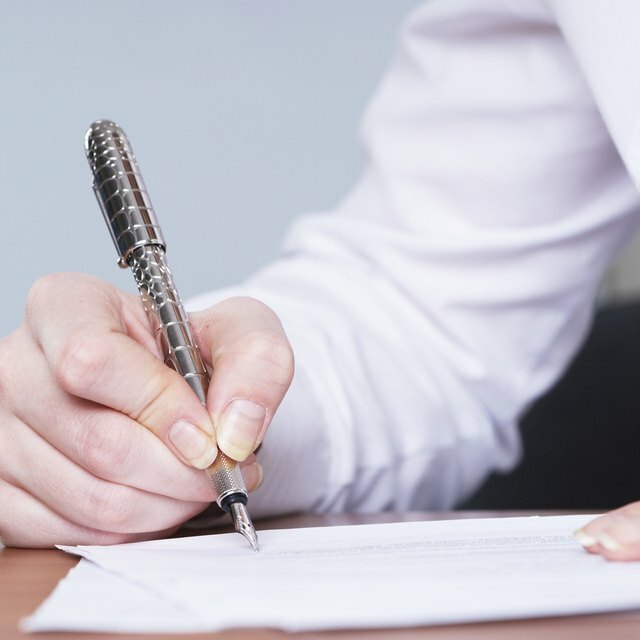 Some companies require their employees to use an approved format and provide their employees with business-letter templates to ensure the formats are followed. However, because each line in a standard block style letter is flush with the left margin, it is very easy to follow its guidelines without a template. If he's using letterhead, the sender need not type his address, which would be the first component of a letter written using the standard block style. The date the letter was written comes next, followed a few lines later by the name and address of the recipient. One line later, the salutation begins the letter. In the body of the letter, each single-spaced paragraph is separated by one blank line. Similarly, one blank line separates the final paragraph from the closing ("Sincerely yours" or "Thank you," for example), which is followed a few lines later by the signature block. As mentioned above, each line is flush with the left margin. Each component of a standard block style letter is included in the modified block style. The difference is that the date, the closing and the signature block begin in the center of the page. Note that they are not centered on the page but are center-justified. This style follows the modified block style. However, instead of making each paragraph of the letter's body flush to the left margin, the first sentence of each paragraph is indented (no more than 10 spaces). The standard block letter style continues to be modified. For example, the Administrative Management Society created the simplified letter style. It is based heavily on the standard block style: each component begins at the left margin and follows similar spacing guidelines. However, the style omits two components (the salutation and the closing) and adds a component (a subject line). Much like that used in a memo or e-mail, the subject line is typed in all caps two blank lines below the recipient's address and two lines before the first paragraph. By omitting the salutation and closing, the writer avoids the common problems of inappropriate salutations and awkward courtesy closings.